Springs are there to balance, lift, keep open and close your door, but no matter how strong they are, they lose their tension and strength overtime. This is where professionals come in. No matter what system you have, torsion or extension, they both need regular maintenance. Springs are rated according to the expected life cycles that depend on the gauge of wire and the weight of the door. However, there are some external factors that can also affect the lifespan of a spring, such as rust and metal pitting. Proper lubrication will help the parts last longer, function more smoothly, prevent rusting and last but not the least, prevent dirt from building up and hardening on the parts causing them to fail prematurely. If the tension is not properly set, the door cannot be expected to function properly. For example, loose tension means the springs can’t properly lift the door. Lifting the door with loose springs is also dangerous because of the weight of the door. On the other hand, too much tension won’t let the door close all the way or remain closed. Depending on the type of springs you have, our technicians will adjust tension either by hooking the spring onto a different hole on the track (extension springs), or by rotating the winding cone in the right direction (torsion spring). There are many DIY websites out there, but before you tackle your broken garage spring problem, be aware of the fact that their replacement requires outstanding mechanical skills, proper tools and appropriate spare parts. 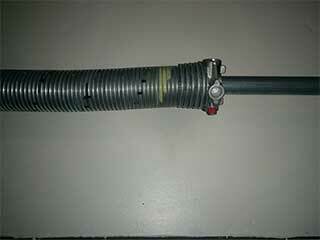 In addition to that, springs are always under tension, which makes them a safety hazard to you and your property. For your piece of mind, call Garage Door Repair Orlando to schedule a visit to your home and let our technicians do the replacement promptly and professionally.